The holiday season is in full swing! That usually means more social activities, filled with yummy food and drinks. There is so much beauty in this season. The sharing. The time spent with friends & family. The delicious food. The merriment. But there are things that often detract from our ability relish in the holiday goodness. Two I want to address today are shame + digestive distress. We have this habit of punishing ourselves for taking part in the celebrations. We vow to set New Years resolutions to go on a strict diet and hit the gym every day. Then, when we aren’t able to keep those unrealistic resolutions, we feel ashamed and even more guilty. Clients often tell me that they experience more digestive symptoms during this season. My clients who have reflux usually find it harder to manage around the holidays. Bloating and constipation seems to be ever present too. Both bloating and reflux are common side effects of overeating. Some people feel anxious about social gatherings. They are unsure what they can and can't eat, often fearing they might get sick from eating the wrong thing. This is a realistic concern for some individuals. Having a digestive disorder or a food allergy can make choosing from the plethora of food options feel overwhelming. I often help clients figure out how to navigate these situations. And feeling poorly because of gastrointestinal symptoms can prevent you from partaking in the jubilee. Thankfully, there are some strategies to address these common matters. I’ve put together some tips on how you can enjoy this holiday season while leaving the guilt & tummy troubles aside. The holiday season is about peace and grace. Give yourself both, especially with respect to food. You can do this by giving yourself unconditional permission to eat. Get rid of the idea that there are “good” and “bad” foods. That gives food way too much power. The feelings of “should” or “shouldn’t” can lead to deprivation and overeating, as well as shame. Instead, let yourself eat whichever holiday dishes, desserts and drinks you desire. By giving yourself the freedom to make unqualified food choices, you'll be less likely to overeat. You'll also be able to actually enjoy the items you are eating. Check in with yourself about why you are eating. Are you actually hungry? Or are you stressed because of work deadline or family drama? If it’s the latter, think about if there is another way to address your stress. Perhaps you can do your favorite workout, talk to a friend, watch some funny videos on Youtube, or journal about what you are feeling. Sometimes, simply recognizing that your negative feelings are giving you the drive to eat is enough to relieve the urge. And if the only way to feel better at that moment is to eat that cookie, then go for it. Just be honest with yourself about why you ate it and leave the guilt aside. As you are eating, ask yourself how your body is feeling. Are you full? Are you satisfied? These are two different concepts and both are important to take note of when we eat. If you determine you are full and satisfied, then you can stop eating. You'll be able to stop yourself before you get that over-stuffed feeling, which can lead to bloating and reflux. If you are full, but not satisfied, think about what would make you feel satisfied. If it’s having that one dessert, then start with a small portion of it and only eat until you feel satisfied. Again, the goal is to avoid feeling stuffed to the brim so you don’t feel physically sick. But if this does happen - and it’s definitely happened to us all - that is okay too. Many holiday goodies are desserts or drinks. You may find that it is easy to go a whole day without eating a fruit or vegetable. Constipation can definitely worsen when we don't eat enough fiber. Make an effort to include at least one vegetable and one fruit at every meal. This guideline will help you get enough fiber throughout the day and promote bowel regularity. Stress can wreak havoc on the gut. So it’s important to be proactive in managing your stress. Make time for self-care activities. They can be as simple and quick if you are short on time. Some of my favorites are reading a good book for 15 minutes, painting my nails and taking my dog to the neighborhood dog café. Eat a well-balanced breakfast every day so you aren’t starting by the evening. Being over-hungry easily leads to overeating and feeling guilty. You can set yourself up to feel good throughout the day by eating in the morning. This breaks the fast from the night. To make it well-balanced, make sure your breakfast includes protein + carbohydrates + fat. If you often worry about whether or not there will be foods you can eat at the party, this tip is for you. Take a dish you know you can safely eat. Don't just pick anything. Make it one of your favorite dishes so you can feel satisfied too. How do you keep guilt + unpleasant digestive symptoms at bay during the holiday season? Do you ever feel like you get into a breakfast rut? I sometimes do! I tend to eat the same 2 breakfasts during the week – either oatmeal or eggs with toast. So on the weekends, I like to change it up. Sometimes that means going out for brunch with friends, and other times it means coming up with new recipes at home. 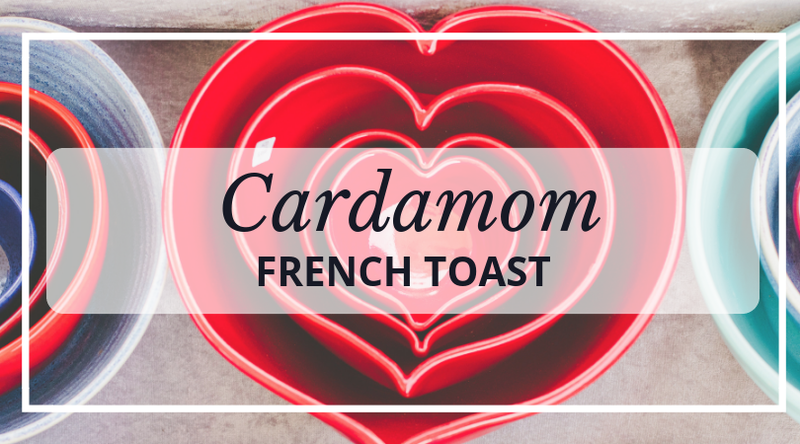 I recently developed a delicious new breakfast recipe that is perfect for kicking off the weekend: Cardamom French Toast! It’s really simple too - just the kind of breakfast I love. Find a shallow dish that is large enough for the bread slice. Crack the egg into it. Add the milk, cinnamon & cardamom. Whisk together. Heat pan over medium heat. Make sure to prep with some oil or butter when hot so the toast doesn’t stick. As the pan is heating, lay the first slice of bread in the egg-milk mixture. Flip it over so both sides get coated. Put the coated slice into the hot pan and repeat with the other slice of bread. You may need to add more spices to the egg-milk mixture. When cooked, serve on plate topped with sliced banana & maple syrup. Enjoy & let me know how your version comes out! Sourdough bread is low FODMAP. I like Bread Alone Bakery’s French or San Fran sourdough. You can also try spelt bread if you can’t find sourdough – it’s another low FODMAP bread. Neither of these are gluten-free though. If you need gluten-free bread, try Canyon Bakehouse breads. My favorite is the 7 Grain loaf. If lactose bothers you, you can use lactose free milk (such as like Lactaid) or a non-dairy milk (like soy or almond milk). Feel free to adjust the spice quantities to your taste preferences. I find I often add more spices for the 2nd slice of bread. If you are sensitive to fructans, look for a banana that is more on the unripe side. It will be lower FODMAPs than a ripe one. You could also change up the fruit topping to whatever you enjoy most! 100% maple syrup is FODMAP-friendly! If you make this recipe, please let me know how it turned out! Comment here or post your version on Instagram & tag me. I’d love to see how you change the recipe and make it your own!